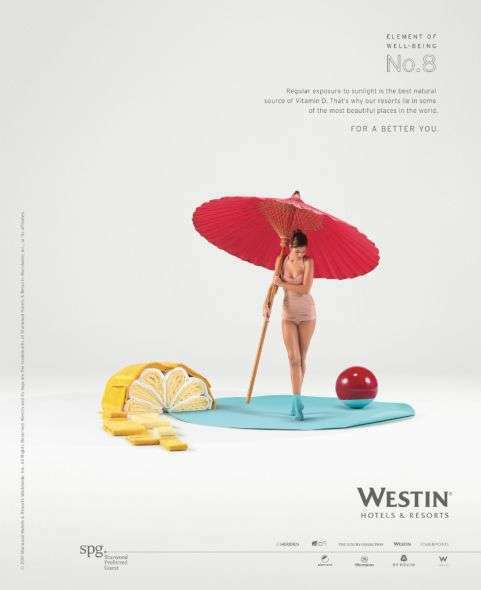 Advertorials: Westin Hotels Promise "A Better You"
Westin Hotels & Resorts is currently capturing the hearts and minds of prospective travelers with its For a Better You ad campaign ... a campaign that promises that its guests will leave feeling better than they felt when they arrived at the hotel. 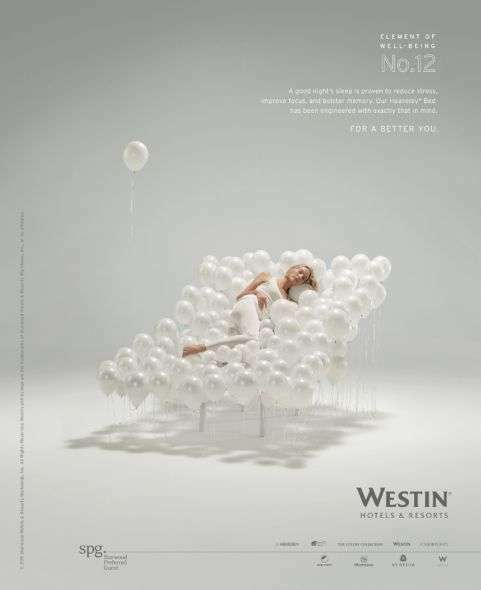 The most visual of the ads in this campaign is the "Heavenly Bed" ad, which features a woman at rest on a bed of balloons. The ad is bathed in white, promoting a sense of serenity and peace. The balloons themselves leave you with a sense of floating on air ... a perfect setting for a heavenly bed. Of the four ads in this campaign, the message in this particular ad is the easiest to instantly grasp and understand. "Westin's entire brand positioning stems from our mission of helping our guests better themselves. The campaign is designed to illustrate how we do this in ways that our competition doesn't and to reinforce the premium experience Westin delivers." 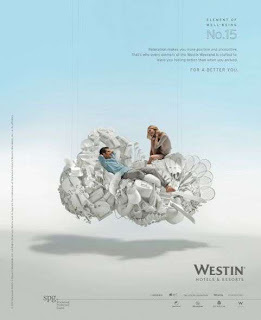 The other ads in the campaign, while visually arresting, do not appear to communicate their intended message quite as quickly or as eloquently as the "Heavenly Bed" ad. This is such on nice post Westin Hotels & Resorts. 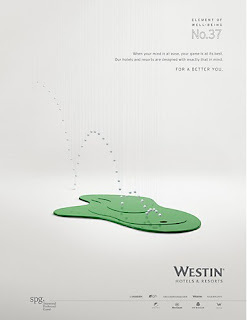 Westin Hotels & Resorts today announced the launch of a global, brand-wide Associate Enrichment Program that will introduce the brand's "Elements of Well Being Platform" to its associates around the world through key touch points. I love that they are arming their employees with the brand message. So many companies neglect their employees; yet, it is the employees that can truly bring this message alive in market.